"No One Has Any Idea What Will Happen..."
Jeffrey Gundlach, CEO of the investment firm DoubleLine, warns that the stock market is ripe for another correction. He spots significant risks in the rapid growth of debt, the unpredictability of monetary policy and potential chaos in the 2020 presidential elections. An interview with the «Bond King». 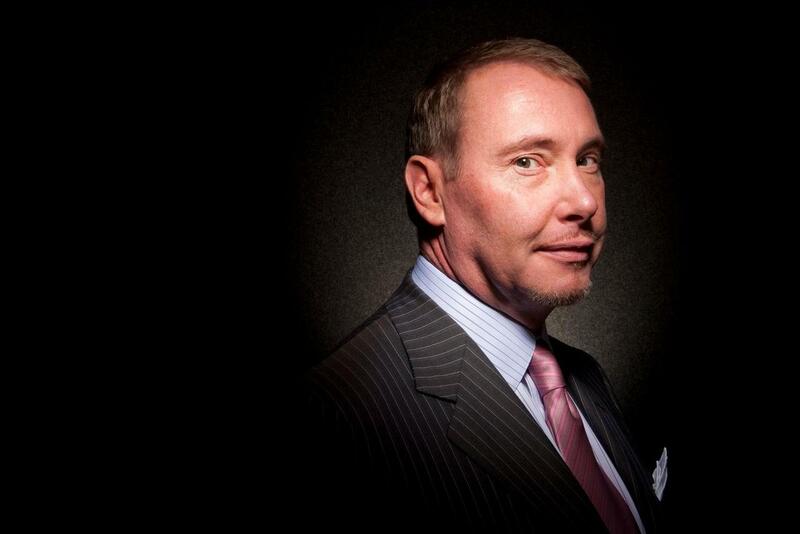 When Jeffrey Gundlach speaks, investors around the world listen carefully. It’s hard to find anyone with a better sense for the global financial markets than the renowned CEO of the Los Angeles based investment firm DoubleLine. He also doesn't shy away from expressing his unfiltered opinion when it comes to the general state of the economy and the political landscape. «We live in a world where a lot of people are changing the rules», Mr. Gundlach says during a wide-ranging conversation at DoubleLine’s headquarters in mid-March. Most troublesome in his view is the rapid growth of debt, ever more extreme central bank interventions and the toxic political climate in the United States. He wouldn’t be surprised to see outbreaks of violence during the 2020 campaign, he states. Against this backdrop, Mr. Gundlach says it’s very hard for investors to earn superior returns. According to this view, the S&P 500 is still in a bear market and will fall into negative territory by the end of summer, at the latest. In opposite to US stocks, he likes short-term Treasury bonds and emerging market equities, as he explains in this exclusive interview with the Swiss financial publication «The Market». Mr. Gundlach, risk assets staged a remarkable comeback during the first months of the year. In the United States, the S&P 500 is close to its record high. What’s your take on the stock market? It’s funny, people make these statements that the stock market is booming. In fact, it’s not really going anywhere. The S&P 500 is basically at the same level as it was back in the fall and at the same level as it was back in January 2018. So, it’s not doing really well. It went way down at the end of last year and then most of the way back up. But that’s not booming, that’s just volatile. What does this reveal about the state of the financial markets in general? Nothing is really changing. The yield on the ten-year treasury went up to 3.25%, but it didn’t last very long there. Then, it went down to 2.4% and now it’s back at 2.5%. Same thing with the Dollar. The Dollar has been reliably stable for basically four years. There was a little bit of variation, but the dollar index has been in the mid to top of the nineties most of the time. Also, gold hardly moves around. The only thing which is really changing is that the economy is slowing down, and the price of oil has been going up. But that’s about it. I think US stocks are still in a bear market. It’s pretty typical for the starting point of a bear market to have a decent down move and then a nearly complete recovery. What many people don’t understand is that this kind of behavior is actually a really good selling opportunity. Nothing has a 100% probability, of course. But one thing which is important for success in investing is what I call trade location: putting the odds on your side. And, when you get this sort of a pattern, that’s a classic trade location for being a seller. At the start of 2018, you predicted correctly that the S&P 500 will be negative at the end of the year. Where do you see US stocks at the end of 2019? I don’t really know, probably unchanged. My highest conviction is an upside down «V» for the first six to eight months: A big move up which we’ve had. But now, given the setup in place, I feel like the short-term top is very close and maybe has already occurred. That’s why I think by the middle of the year and certainly by the end of the summer the S&P 500 will be negative year-to-date. Once again, investors are betting on the central banks to bail them out when things get dicey. What are your thoughts on monetary policy ten years after the financial crisis? The central banks have always been able to set short term interest rates. But now, they peg long-term interest rates as well at any level they want and that creates malinvestment all over the system. We’ve had years of negative interest rates in Europe and in Japan. Even ten-year bonds are yielding negative in Switzerland, and sometimes in Japan and Germany. When interest rates are negative, there is no reason to own these bonds whatsoever. That means money finds its way into speculation or real estate or venture capital development. The danger of this is that if the central banks ever stop trying to peg the rates, the consequences of all the malinvestment will be revealed. Yet, the central bankers seem to be confident that their unconventional measures are working. There is an old saying that someone has a tiger by the tail. In other words: they think they have the situation under control, but when they let go, the tiger will maul them and kill them. That’s the problem central bankers have gotten themselves into. There is almost no way out of the situation they have created. As these radical policies have incrementally been implemented, they open the door for acceptance of the next increment of radical policies. What’s the next step in terms of these radical policies? Here in the US, there is growing support for candidates trying to get the Democratic nomination by promising to give people money. One of them is Andrew Yang, a tech guy out of Silicon Valley. He wants to give everyone $1,000 a month. That’s $4 trillion a year. To which I say: why stop there? If $12,000 a year is so helpful, why not do $24,000? Or $24 million? Or $24 trillion? That would eliminate all wealth inequality. We could pay off the national debt and have every single person be equally wealthy. Of course, the illogic here is that giving people monetary computer credits doesn't create anything. Everything is exactly the same except you now have stolen the wealth of everybody who saved and earned it and you have a depression-like anarchic system. It’s weird how people think that a little of this money for nothing is helpful, when anyone can see that taken to the extreme such measures would lead to an absolute implosion of the system, including Weimar Republic or Zimbabwe style inflation. There is also a lot of talk about Modern Monetary Theory. What are your thoughts on this idea? We’ve come to a place where almost anything can be accepted as a valid idea. Modern Monetary Theory essentially says it’s ok for the US to borrow like Japan because our debt is in our own currency. Japan had a massive increase in debt and it’s very difficult to find any obvious consequences other than the fact that it has been thirty years since the peak of the Japanese stock market. Today, the Nikkei 225 is still about 50% lower than it was at the end of 1989. So, I have to believe that there is some connection between zero interest rates, enormous growth of debt and the lack of economic success. These ideas may be intended to create a better society with more fairness and opportunity, but a lot of them have the opposite effect and are distracting from the real problems. In the United States, the roads are falling apart, bridges are collapsing and many airports are third world quality. California for instance, has gone from ten million to forty million residents without doing anything in terms of water projects or expanding the freeway system. We can’t even afford to build a train from Los Angeles to San Francisco. It’s very telling when the wealthiest State in the US can’t afford to build a train between its two massive population centers. What are the consequences of this situation? Many candidates in the Democratic Party have an incredible agenda of spending trillions of more unfunded dollars while the US already has unfunded liabilities of nearly 600% of GDP. Last year, the national debt rose by roughly $1.5 trillion or 7% of GDP - and this in a supposedly strong economy. One has to look at this in sort of disbelief. It would be nice if we’re just watching a bad movie. But in reality, we continue to move in an accelerating pace towards a dysfunctional economic system. It will be interesting to see just how extreme the policy reactions are to the next economic downturn, because it was the last recession that brought in these. What could such measures look like? The next downturn will massively expand the federal deficit. This means that the amount of bonds which would need to be issued would also be massive. So on natural market forces, interest rates would have to go up on long-term bonds. This would make a severe recession even worse. So, it's possible that the Federal Reserve will aggressively emulate the Bank of Japan and maybe own every single treasury bond. That’s why it’s very difficult to predict where long-term interest rates are going. How surprising is it to you that long-term yields are still quite low despite the rapid growing debt? Interest rates should be higher based on what is going on structurally in the market and based on what the Fed said it was going to do. In December, the Fed said it was going to keep on with quantitative tightening, no matter what. Then the stock market fell apart, and within weeks, the Fed in a fairly spectacular way completely changed its guidance in terms of rate hikes and quantitative tightening. They abandoned their forward guidance for 2019 before 2019 even began. So, it’s all laid bare that the Fed’s forward guidance is completely uninformed and can change 180 degrees in a very short period of time. Yet, on Wall Street everybody is happy that we are not going to have these economic stresses anymore. Bond yields have come down some as well in celebration of less quantitative tightening which means fewer bonds in the market. Some investors are even expecting interest rate cuts now. What will the Fed do next? In the United States, interest rates are likely to go up in the next downturn if market forces are allowed to prevail. But the Fed could very well resume quantitative easing. They already have begun talking about it. While nominal GDP is at 5.3%, they have made statements that they are thinking about quantitative easing; not in response to a crisis, but as a normal exercise. This strikes me that they’re priming the market for QE4, happening certainly in response to the next downturn. What’s more, by saying it’s a normal policy tool they might do it even without a downturn or without taking the Fed Funds Rate down to zero. So, we live in a world where a lot of people are changing the rules. A downturn could happen right at the same time as the presidential elections. You were one of the very few people who predicted Donald Trump’s victory in 2016. Who will win in 2020? It’s too early to tell. There are going to be twenty Democratic candidates. So, you have to at least see how they perform on the debate stage. At the end, two candidates might have a real chance to compete for the Democratic nomination and both could be well funded. One who’s a democratic socialist and someone like Joe Biden. There could also be a funded mainstream Republican in opposition to Trump. There is a plausible scenario in which no one would win the Electoral College. There is this ever-increasing discord. Even though the 2016 election struck people as unusual, the 2020 election will be far worse in terms of bizarre behavior. We could have a real crisis in which the House of Representatives picks the President and the Senate picks the Vice President. Imagine the uproar over how «illegitimate» that election would be. But you have these two parties that philosophically do not jibe together in any way anymore. Also, we will likely see violence in the 2020 campaign. There will be more than just people heckling. There will be real violence, maybe even riots. What should investors do in this kind of environment? Since January of 2018, I have been saying it’s going to be a very difficult market to make money in. Last year, more than 90% of world assets lost value and we are continuing to be in a very hard environment. One of my recommendations is something as unspectacular as two-year treasury bonds: They’re paying 2.5% interest, you are going to get your money back when the world will probably be in a very bad place as these bonds mature. So, you may want liquidity to take advantage of the pain that other investors are feeling. What kind of pain are you thinking about? We had a legitimate presidential election and the establishment didn’t like the result. They spent the last two years plus trying to wait it out, cause problems, try to slow things down and regroup. So, here’s the question: If Trump’s victory based on the Electoral College caused so much friction, what will a President chosen by Congress do? If I’m right that there could be a legitimacy of more than one candidate per «party», the financial markets are doomed. No one will have any idea what will happen. What does this mean for bonds? The biggest problem of the bond market in the next economic downturn is going to be high grade corporate debt. This segment has really increased in terms of outstanding supply. Corporate bonds have been used to finance buybacks and they have been purchased also by corporate pension systems. There are so many of these bonds and many of them are misrated: A lot of what’s rated investment grade should be rated junk, so it will be rated junk in a downturn. The market will be just overwhelmed with supply during a period when there are no natural buyers. What should investors look out for right now? I think the Dollar is going down and that will change a lot of things. After a decent move up, the momentum of the Dollar is basically non-existent. And whenever you have momentum of an asset disappearing and prices holding up, it’s a great trade location to bet on it going down. Moreover, the expansion of the twin deficits is highly correlated with a weaker Dollar. I also think the Fed signaling no more interest increases is incrementally negative for the Dollar. A softer Dollar could benefit emerging market stocks. Is that a good place to put money in? I’m not sure that you will make a lot of money in emerging markets. But if equities do well this year, you will make more money in emerging markets stocks than in US stocks. On the other hand, if equites do badly, maybe the fourth quarter pattern will re-emerge: emerging markets stocks went down less than US stocks. This is very rare. Usually, when developed markets have a problem, emerging markets do much worse because they have a higher beta. But incredibly, emerging markets have outperformed during the recent market downturn, even without a weaker Dollar. And now, they are performing just fine on the rebound. And how about European stocks? I don’t want to do anything with Europe. The Euro might go up, but I have no interest in European bonds which yield negative. In addition, European equities have been a persistent value trap. Europe's problems are unbelievable. Part of it has to do with negative interest rates. Just look at the merger talks between Deutsche Bank and Commerzbank: One seemingly bankrupt German bank merging with another, not quite so bankrupt but not healthy German bank. So, it’s like, what do you get when you merge two unhealthy banks together? One unhealthy bank.